First I had a Session with my 13 at Bozo Beach. 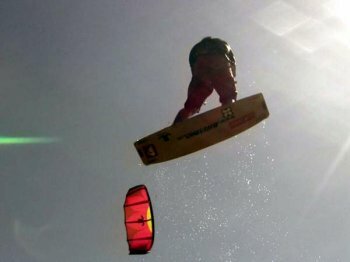 The wind was light but I’ve been able to do some nice tricks and also kiteloop2hp is no problem with this size. After this session we had a nice lunch. When we finished the wind picked up to 25kts and my dad and I decided to take our motorscooter and go to La Boca for some flatwater training. After all the chop at Bozo this was a really good choice. When we arrived the wind blew perfect for my 7. 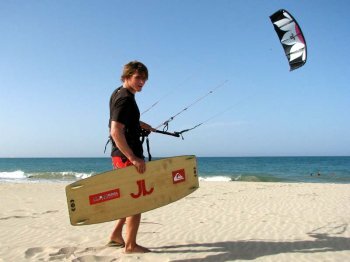 I could do some nice and high kiteloops and also some tricks I haven’t done for long time. It felt good to ride in these conditions and I was super happy after my sessions. Lets see what tomorrow will bring… So stay tuned!! Our second day here in Cabarete brought us a lot of of wind! It picked up around 1 o’clock and got pretty strong. I pumped up the 9m and went out for my first session of the day. In the beginning it was choppy and crowded but it got better later the day. At the second session my father took some pictures which you can find in my gallery. I get more and more used to my new gear and the tricks felt better and better. Today some riders arrived here in Cabarete and it was cool to be on the water with them. It’s always super-motivating to ride with the best riders of the world. Today was the first day for us here in Cabarete. After putting all the stuff together we got some breakfast and then we looked for the wind. 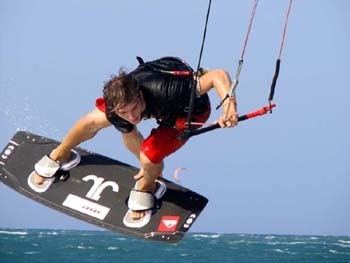 It seemed gusty but windy and so we decided to go for a session. I pumped up my Prima Donna 2 in 9sqm and went out for two hours. I had a lot of fun altough the wind was bit gusty and turning the direction all the time. I could stick some nice tricks. I also have been the first time out on my new harness, the Mystic Firestarter. It felt perfekt and its fitting awsome. Thanks to Move - Surfstore for that stuff!! Later that day I had a second session and we took some pictures on the beach. You can see them in the gallery. Now I’m relaxing the rest of the day and wait for tomorrow for the next sessions. Today my father and I arrived in the Dominican Republic. After a long trip from Munich to Puerto Plata we were happy to get out of the plane late in the afternoon. It was sooo closly… I could hardly move. We are staying here in Cabarete at the Viva Wyndham Tangerine in the Bozo bay. This hotel is directly on the beach and close to the worldcupspot. Its a huge complex with 3 restaurants, 2 Bars and the best: all inclusive!! At the arrival it was little bit raining here and not so much wind. I hope that here it’s windy tomorrow. The forecast looks promising. I’ m looking foreward to get more used to my new gear. I’ ll keep you updated about what’s going on here. Perhaps we can also take some pictures too. So stay tuned! !